Budget all-rounder. Lenovo sends its 15-inch notebook off to the race, this time with the AMD Vision processor and dual GPU. The AMD-only combination seems quite unique, since most competitors rely either on Intel and Nvidia or Intel and AMD. 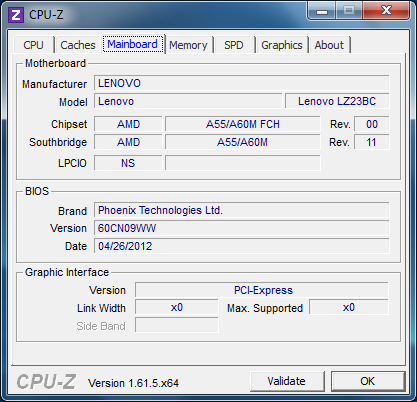 The current Lenovo IdeaPad Z585 carries the model name MAD65GE and stands out among the competition, as already mentioned, with the AMD combination. Equipped with the AMD A10-4600M, a quad-core processor and dual graphics HD 7660G + HD 7670M for games, our test unit is ready for a variety of applications in the multimedia area. Lenovo offers six different devices in this series with various hardware features. All the models come with 64-bit Windows 7 Home Premium. While the entry-level units come with only a dual-core CPU, 4 GB system memory and 500 GB HDD, the better equipped version have a quad-core processor, more RAM, 1000 GB of storage space and even a Blu-ray drive. 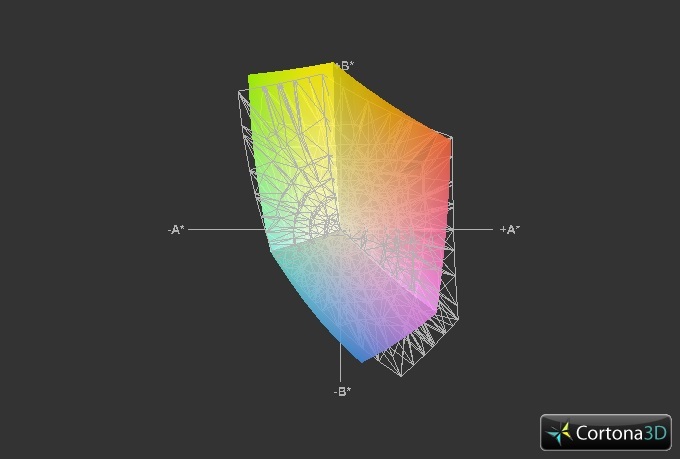 All the models feature a 15.6-inch display with 1366x768 resolution and high-gloss surface. At this point we would like to refer to the already reviewed Lenovo IdeaPad Z580, which relies on an Intel processor in combination with an Nvidia graphics card, but is otherwise identical. When it comes to features of the display, the case or input devices, we will talk in broader terms; as for the specific details, please refer to the above linked device. In this review we would like to point out the differences to similarly equipped rivals and will therefore constantly refer to the following models: Acer Aspire V3-551G-10468G50Makk, Toshiba Satellite L850-153 and Samsung NP355V5C-S05DE. All three have similar GPU or CPU solutions and are in a similar price range. As with the already reviewed Lenovo IdeaPad Z580 and IdeaPad Y580, our test unit surprises us with a high-quality, brushed aluminum look. But the first impression can be deceptive - the back of the case and the keyboard frame are made of anthracite black plastic. Nonetheless, this solution makes a good impression, because even after prolonged use, we find only a few fingerprints on these areas. The display bezel is a different case though, because it is made of the dreaded piano black plastic, which is a known magnet for such fingerprints. On the lower side we see a seamless transition with the two properly sized hinges - we cannot point out any weaknesses here. Despite the materials used, overall the notebook is quite stable. Although you should not expect any miracles, we did not detect any disturbing deformation when lifting the notebook by its edges or when opening and closing the lid. Only the case cover is a bit wobbly. With a weight of 2.65 kg (~5.8 pounds), the IdeaPad Z585 is on the heavy side of its class. The available interfaces largely correspond to what currently appears in the 700 Euros (~$893) price segment: four USB ports - two of which offer USB 3.0 support – leave plenty of options for connecting peripherals. 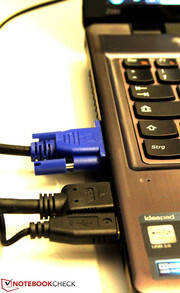 Exceptional flexibility is offered by the HDMI and VGA ports, allowing the connection of older monitors or projectors. Even the use of two external monitors is achieved with ease, although this leads to unpleasant fan noise. With the exception of the card reader, which has been placed on the right half of the front, all the interfaces are located on the two sides. On the right side, the two audio jacks are located somewhat too far forward. 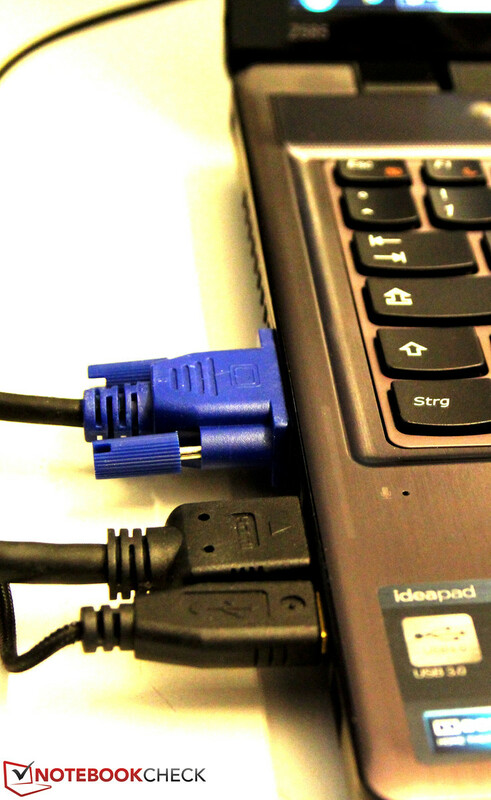 When an external mouse is connected, the use of these and the ports on the left side can be hindered - especially for left-handed users. The integrated Blu-ray drive, model Optiarc BD ROM BC-5550H, expands the already wide range of multimedia functions. The IdeaPad Z585 has all the necessary interfaces for essential use. The Ethernet port is realized via the RealTek-TRL8101 controller and supports data rates of 10/100 Mbit/s. The Broadcom 802.11 b/g/n by Microsoft provides WLAN wireless connection. Bluetooth Version 4.0 is also on board. 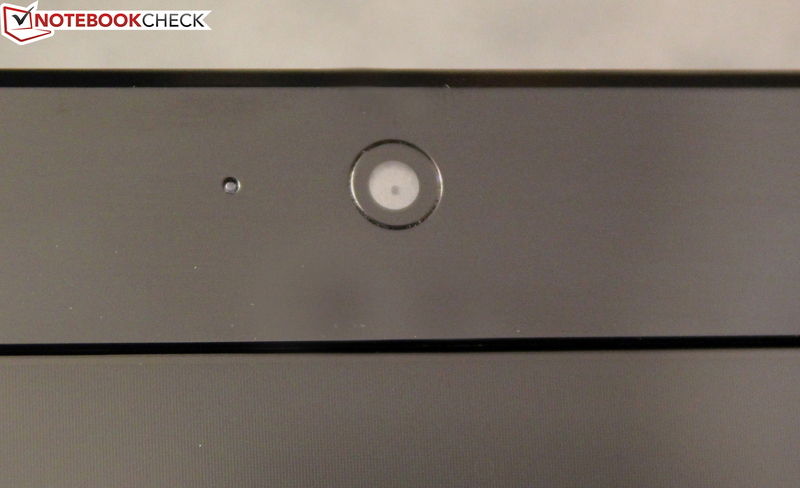 The integrated webcam unfortunately could only capture 640x480 pixel images in our test, despite the manufacturer claiming that a 1.0 megapixel camera is installed. Overall in daylight the quality is convincing, but in poorly lit environments the picture quality drops significantly. There are no goodies, such as a notebook carrying case, in the package. Even the previously standard recovery media is now to be burned by the user himself via the OneKey recovery software. In the package we find safety instructions, warranty information, and a quick-start guide that describes the first steps in setting up the IdeaPad. The bottom cover of the notebook can be opened by removing a single screw. 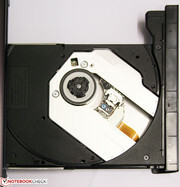 This allows access to the case fan, the 2.5-inch hard drive with 9.5 mm (3/8 in.) 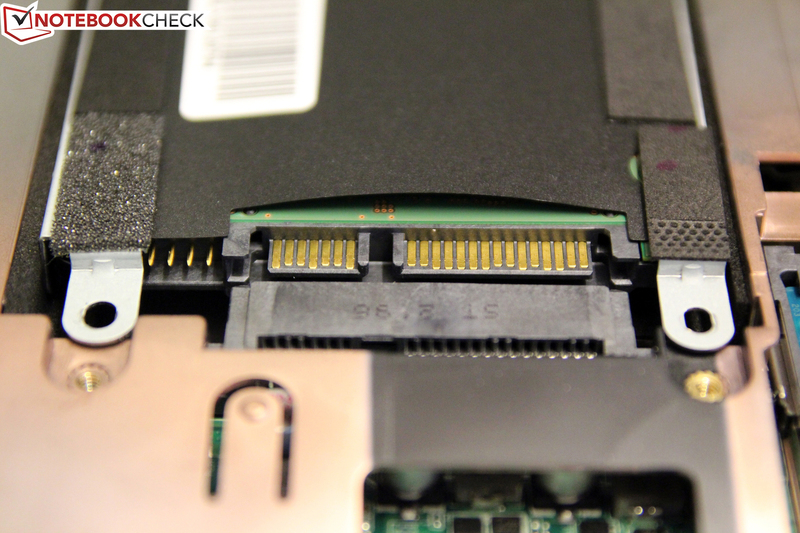 height, and the two DDR memory slots. Lenovo delivers the current model with an extended two-year warranty, which covers both spare parts and repair, while the battery is only covered for one year. In addition, the manufacturer offers services such as accident protection and warranty extensions at the price of 40 Euros (~$51) per year. 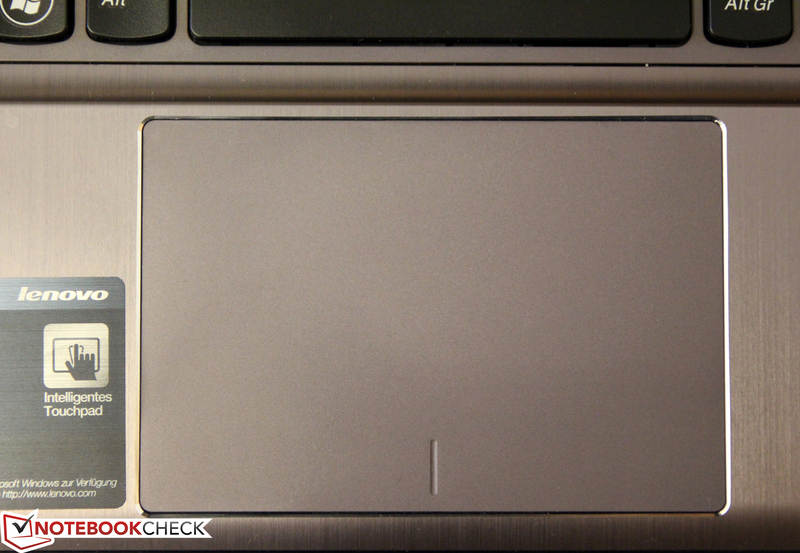 The input devices of the Lenovo IdeaPad Z585 are identical to the already reviewed IdeaPad Z580. 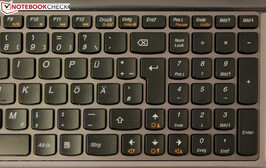 The typical Lenovo AccuType keyboard with separate number pad comes without backlighting. Overall there seems to be a lack of space for the two blocks. 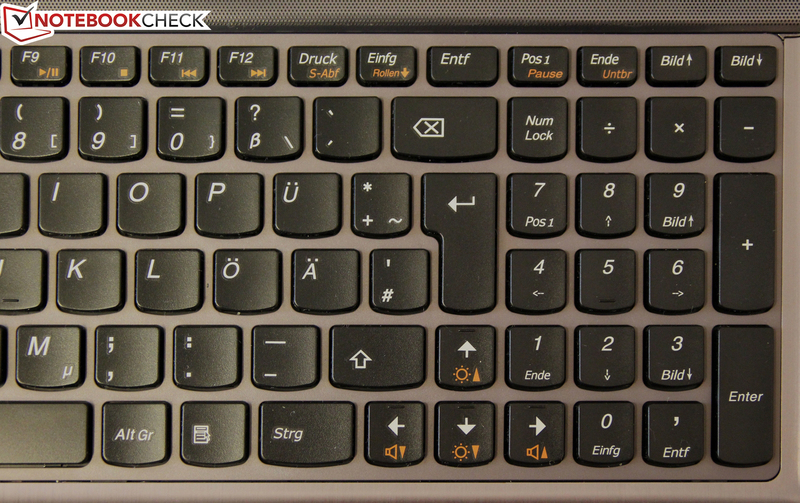 For a better overview, there should have been a clear separation, as with the arrow keys. In addition the two Shift keys are uncomfortably small, which does not allow fluid and intuitive work. The touchpad is positioned slightly to the left of the center and is pleasant to use for prolonged periods of time without the need of an external mouse. The pre-installed Synaptics ClickPad software has extensive settings, such as the practical one finger scroll and the adjustment of sensitivity. You can find further information about the input devices in our review of the gaming notebook Lenovo IdeaPad Y580. All of the various IdeaPad Z585 models have a 15.6-inch glossy-type display with the multimedia aspect ratio of 16:9. The panel, illuminated by LEDs, carries the model name Au Optronics B156XW02 V0 and has a visible working area of 344x194 mm. This means a pixel pitch of 0.252 mm. Since we have a Blu-ray drive in our device, a Full HD resolution would have been a better fit for the overall package than the 1366x768 pixels available. As we previously mentioned, up to two external monitors can be connected via the VGA and HDMI ports. 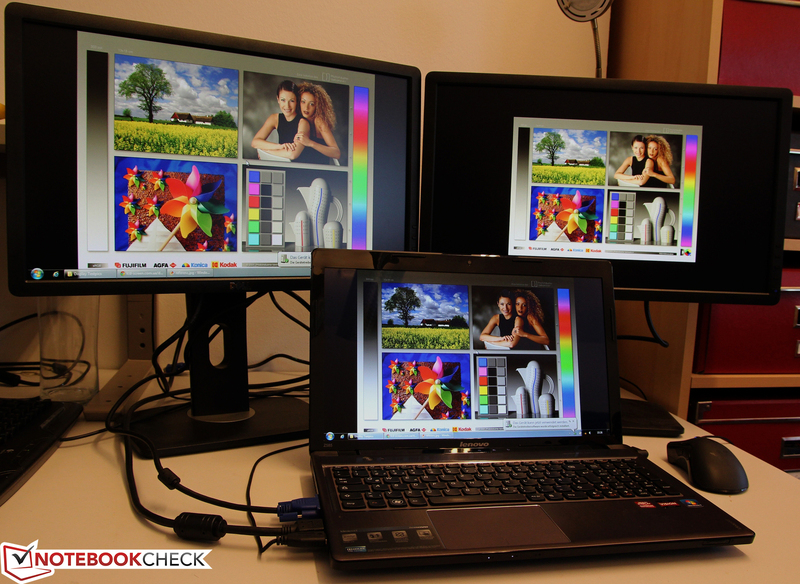 We put two identical Dell U2212HM with IPS panels and Full HD resolution side by side. The HDMI performed as expected - crisp. The image coming from the VGA port surprised us positively - text was clearly legible and it took closer inspection to notice that the whole image was a bit brighter. Let's take a closer look at the lab results: the illumination of 85% is acceptable and the brightness measurements showed an average value of 196 cd/m², thus placing the Z585 in the middle of the range. 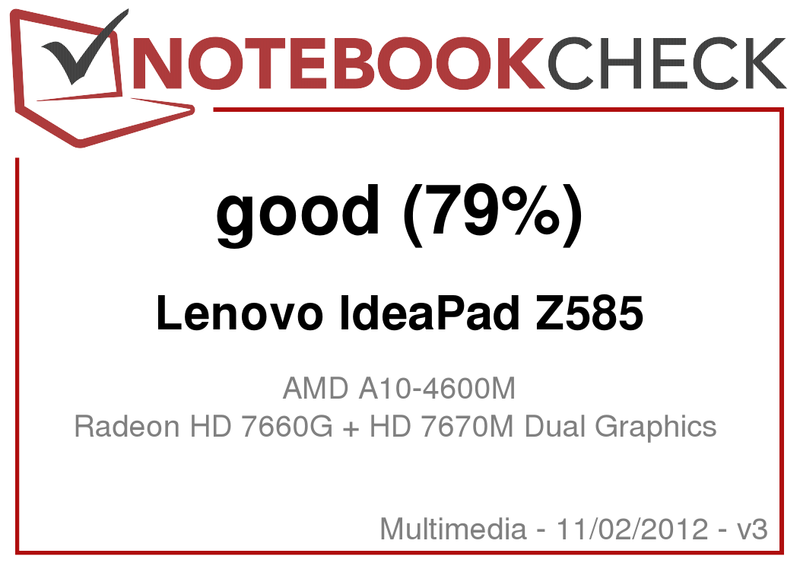 The already reviewed Intel counterpart, the IdeaPad Z580, performed a bit better with an average value of 212 cd/m² (Lenovo usually installs a different panel in the Intel versions). Acer's Aspire V3-551G-10468G50Makk, which also uses an AMD solution for the graphics and processor, reached similar values. The Toshiba Satellite L850-153 and Samsung NP355V5C-S05DE, which are also in the same multimedia segment, offer quite similar displays. Even though the disappointing black level of 1.22 cd/m² is a drawback only in the dark scenes, we expected more of a multimedia notebook. Things look the same with the contrast ratio of 166:1, which is due to the cheap TN panel. Subjectively, we are happy with the panel for office application, such as MS Word or Internet browsing. Outdoor: because of the direct sunlight, hardy anything can be distinguished. 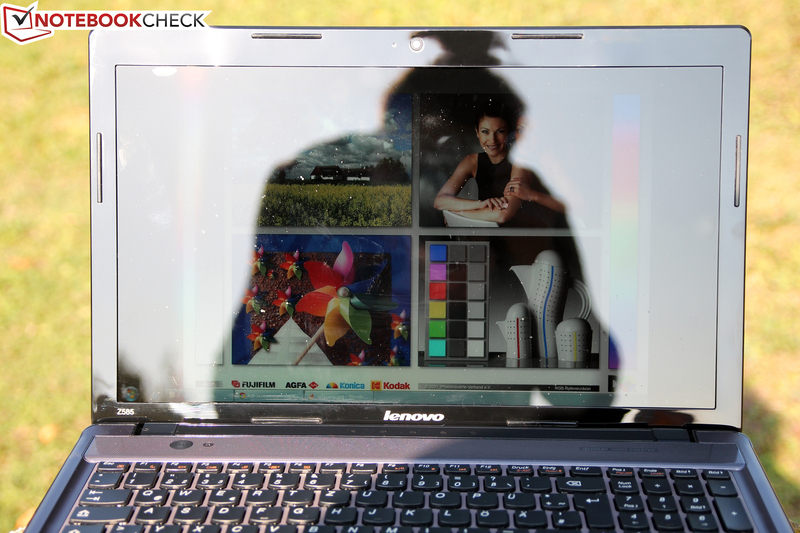 Unfortunately, the multimedia notebook is not convincing in outdoor use. Because of the glossy display and the mediocre brightness, the device is simply not suitable for direct sunlight use. An artificial light source behind the user can be equally disturbing. The viewing angle stability is also typical for a multimedia device of this class. 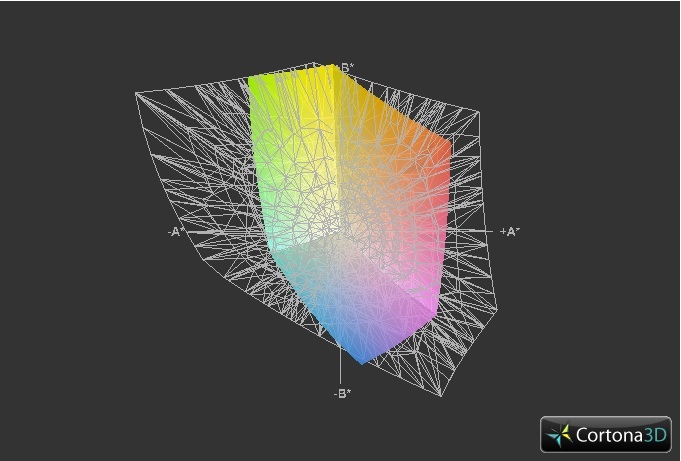 The colors suffer mostly in vertical changes. Horizontally we barely noticed any changes with the bright colors in office use. Blu-ray movies cannot really be enjoyed without disturbing image distortion, because of these tight angles. Our test unit of Lenovo's IdeaPad Z585 comes with an unusual combination of AMD A10 APU and a dedicated graphics card from the same manufacturer. This hardware should theoretically suffice for everything the multimedia segment requires. The graphics card is used when playing 720p YouTube videos and Blu-rays, thus loading the processor to only 10 to 15% in our test. The graphics team can even tackle modern games, although demanding titles of the latest generation, like Skyrim and Battlefield 3, run smoothly at medium setting at most. 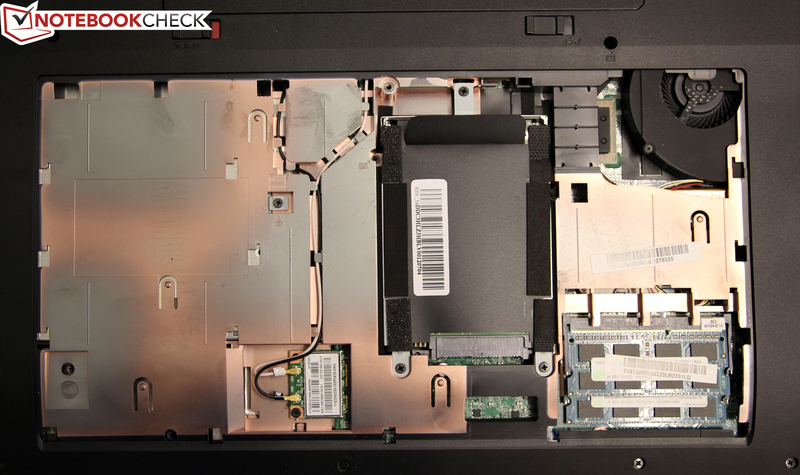 The heart of the IdeaPad Z585 is a CPU with the codename Piledriver - an enhanced version of the Bulldozer architecture. 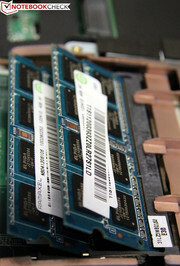 The four cores are divided into two modules and run at 1.4 to 2.7 GHz. 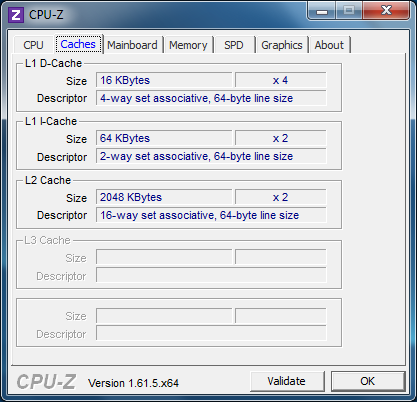 When only one core is under load, the processor's frequency increases to 3.2 GHz. On battery power, after setting the energy profile to high performance, the CPU should not reach more than 2.3 GHz. The AMD A10-4600M supports the following instructions: SSE (1, 2, 3, 3S, 4.1, 4.2, 4A), x86-64, AES, AVX, FMA. 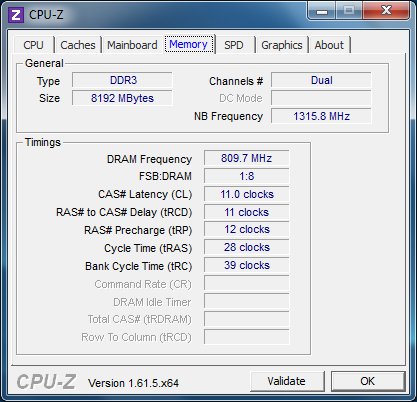 The CPU benchmarks showed no serious abnormalities. The results, in both single- and multi-core Cinebench tests, were as expected - on par with the list of similar notebooks. In the single-CPU benchmark Cinebench R10 (64-Bit) the notebook reached 2822 points. 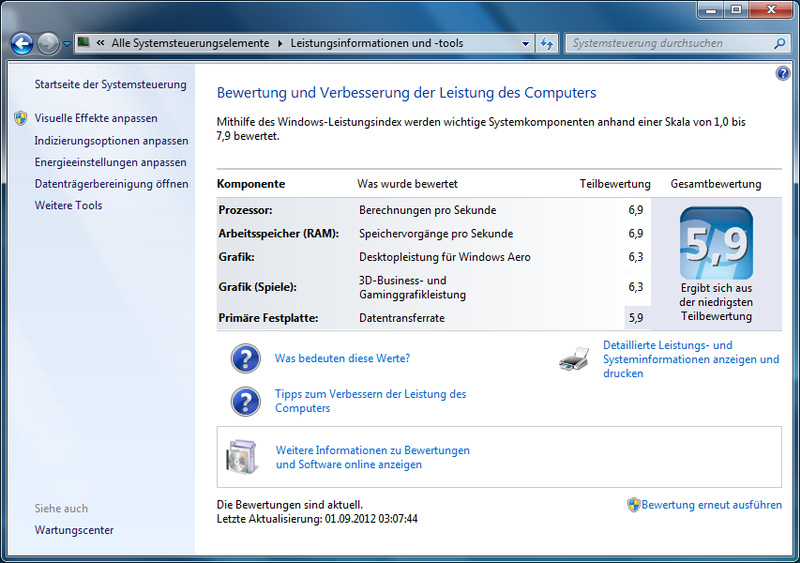 8059 points was the result with four cores, which corresponds to the performance of the Intel Core i3-2330M at 2.2 GHz. The performance of a system is always as good as its slowest component. 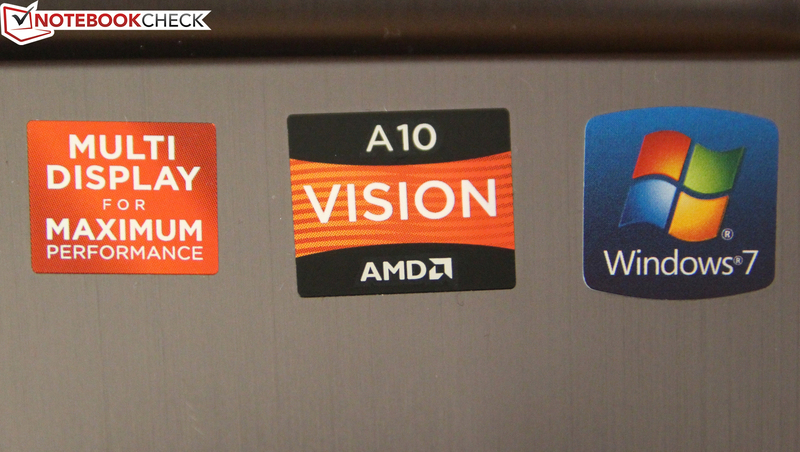 In our test unit we find the latest hardware from AMD allows working smoothly at all times. The only downside is the hard drive. In our test of simultaneous unzipping of files and Cinebench opened, the slowly rotating Seagate Momentus SpinPoint M8 hindered efficient work. Images stored on the desktop could be opened only after the unzipping was done. The use of an SSD could have easily removed the existing bottleneck. In all fairness we have to note that we forced this scenario and similar performance drops were not noticed for the whole duration of our tests. 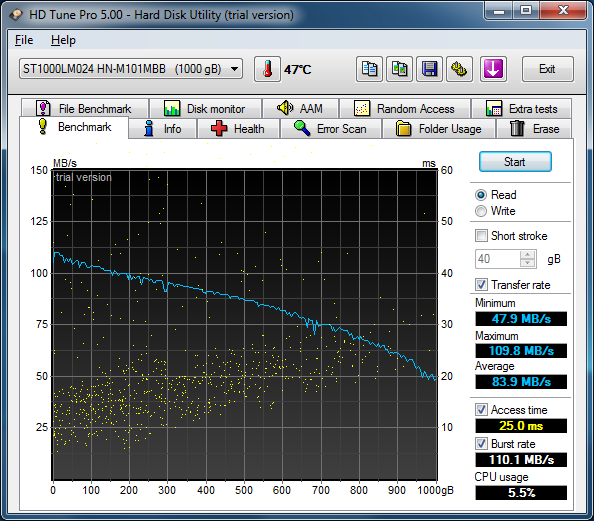 The results of the PCMark Vantage and PCMark 7 confirm this performance. The 1863 points in the PCMark 7 place our IdeaPad in the lower middle half of our Benchmark database. 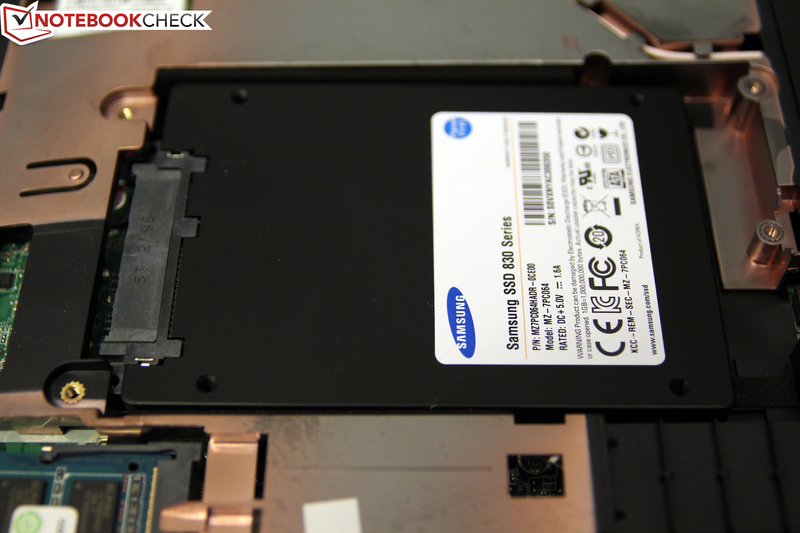 A fast SSD could have almost doubled that score, which comes to show the weakness of the system. In addition, such an upgrade would have surely halved the startup time of 50 seconds. Let's take another look at the similarly equipped Lenovo IdeaPad Z580 with Intel processor and Nvidia graphics card: the Windows Experience Index shows better results in all respects (except for data transfer) for the Intel version with a Core i5-3210M. It is also better than our test unit in the PCMark Vantage (7732 points) and PCMark 7 (2079 points) benchmarks. Depending on the model, Lenovo installs a hard drive with a capacity of 500, 750, or 1000 GB. The top model, as with the IdeaPad Z580, is equipped with a Seagate Momentus SpinPoint M8 with 1000 GB capacity, which works at 5400 rpm. In the previous section we already mentioned that this hard drive does not match the rest of the system and an SSD upgrade would make sense. Unfortunately the manufacturer does not offer this option. 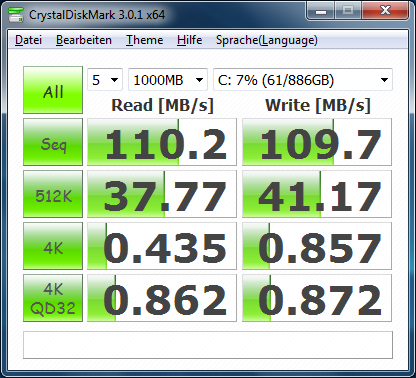 According to CrystalDiskMark, the slowly rotating hard drive reached a sequential read rate of 110 MB/s with an access time of 25 ms. The Lenovo IdeaPad Z585 features a dual graphics solution: the AMD Radeon HD 7660G, integrated in the APU, works in combination with the AMD Radeon HD 7670M, a DirectX 11 middle class card with 2 GB of memory. CrossFire, the simultaneous use of both cards, is activated from the start. 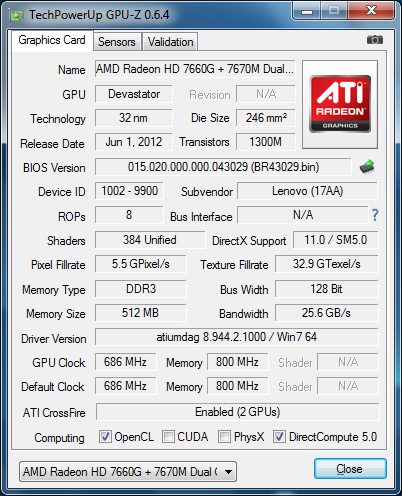 Alternatively, the HD 7670M can also be deactivated. We place special emphasis on the fact that dual GPU solutions are usually vulnerable to micro stuttering and sometimes unexpectedly low frame rate, due to lack of driver support. Unlike the already reviewed Acer Aspire V3-551G-10468G50Makk, whose graphics card could not run at its maximum, the Z585 leaves no room for criticism here. The clock frequencies remained at the expected level even under the simultaneous utilization of both CPU and GPU via Prime95 and FurMark. 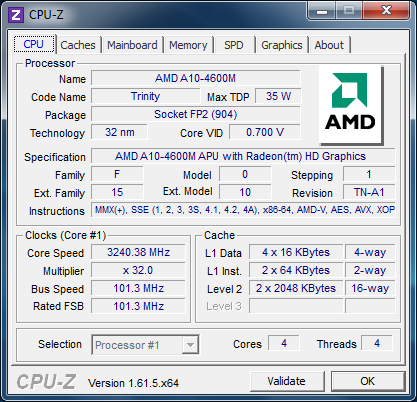 The following values were confirmed by GPU-Z: AMD Radeon HD 7670M – 600 MHz on the GPU, 900 MHz on the graphics chip (on AC), and 400 MHz on the GPU, 400 MHz on the graphics chip (on battery). As you can clearly see, the notebook runs at significantly lower frequencies without AC power, which has a negative impact on the gaming performance. The synthetic 3D benchmark FurMark showed nothing out of the usual: as expected, notebooks with Intel CPUs and similar graphics cards perform better in the CPU-heavy 3DMark 03 and 05, whereas in 3DMark 11 and Vantage our system's dual GPU takes the lead. When we compare the results to the Intel based IdeaPad Z580, we see the following: in 3DMark 11 the IdeaPad Z585 is almost twice as fast and in 3Dmark Vantage we notice a lead of 2000 points. Thanks to the middle class graphics solution, even current games, such as Battlefield 3 and Anno 2070, are fluently playable at medium settings. Both games run with an average of 30 fps at 1366x768 pixels. Older games, such as Trackmania Nations Forever or Mafia 2, can even be played with higher settings. The Acer Aspire V3-551G-10468G50Makk reached a similar frame rate, proving that the components in both systems work well together. 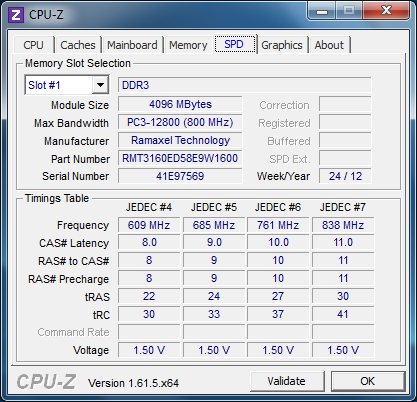 The online RPG Torchlight 2 and the Toshiba Satellite L850-153 showed us the drawback of the dual GPU configuration. The Toshiba notebook comes with a single HD 7670M and should, theoretically, be slower than our graphics team. But this was not the case: at higher settings, the single graphics card managed 68 fps, while our test unit only reached 47 fps – a good example of the poor driver support. The case fan is definitely audible, but not disturbing. When using two external monitors it is most noticeable. If you disconnect the monitors, it calms down and is only slightly noticed: we measured between 33.1 and 35.7 dB(A). 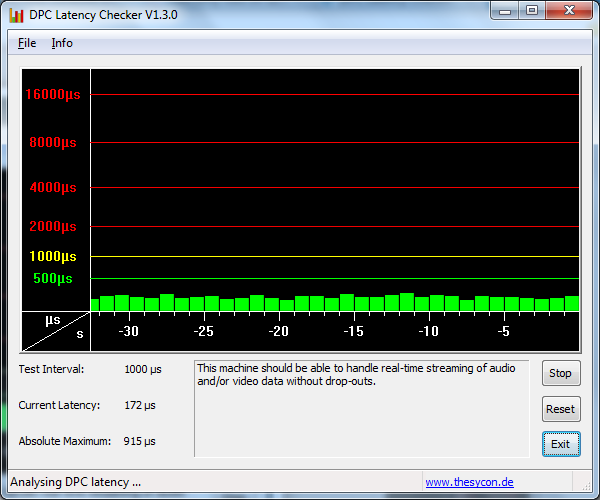 When playing a DVD the noise reaches 35.6 dB(A), but that is hardly disturbing. Only in the case of artificially created full load, which can hardly be reached in everyday use, did we measure an unpleasant maximum of 46.2 dB(A). When gaming, the noise remains at a significantly lower level and escapes our attention in the heat of the battle anyway. 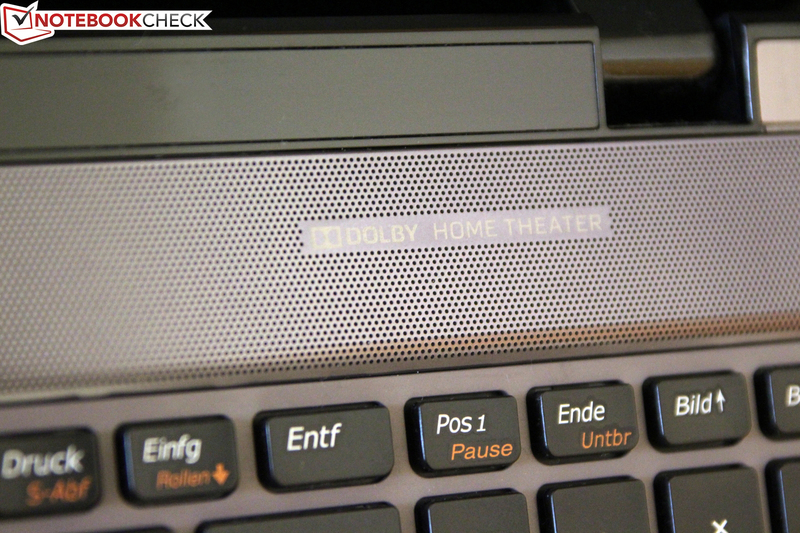 In idle mode, the IdeaPad Z585 remains properly cool, thanks to the constantly running fan. The maximum temperature in the central region of the keyboard was at 33 °C (91.4 °F). We measured 27 °C (80.6 °F) on the palm rest – a really good value, which only increases to 36 °C (96.8 °F) under load. This is very good. The stress test, however, shows the weaknesses: on the left is the only outlet for the hot air. On this spot we measured 51 °C (123.8 °F) - not dangerous, but still very high. If we use the notebook on the lap while browsing the web, the temperatures remain in the green. But as soon as we start a demanding application, the notebook becomes uncomfortably warm. Even under 100% load on the processor and graphics card via Prime95 and FurMark, we did not observe any throttling - lowering of the frequency of components. The CPU reached a maximum of 90 °C (194 °F) after two hours, running constantly at 2700 MHz. (±) The maximum temperature on the upper side is 43.3 °C / 110 F, compared to the average of 36.5 °C / 98 F, ranging from 21.1 to 71 °C for the class Multimedia. 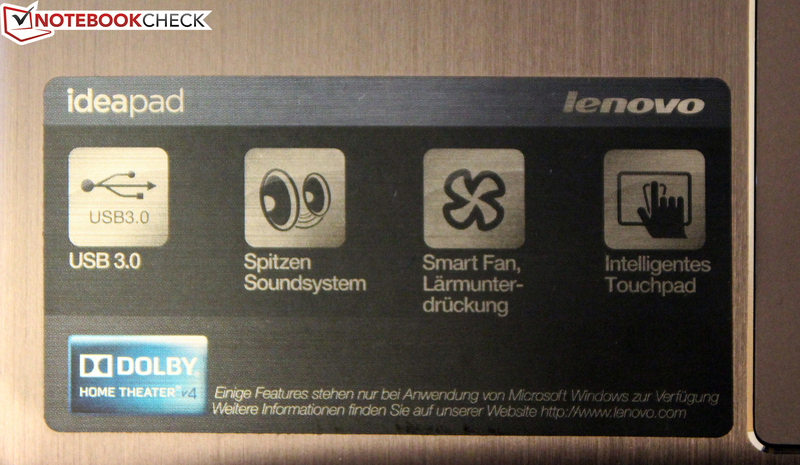 The sound system, consisting of two speakers with 2 W total power, is the same as the one in the already reviewed Lenovo IdeaPad Z580. 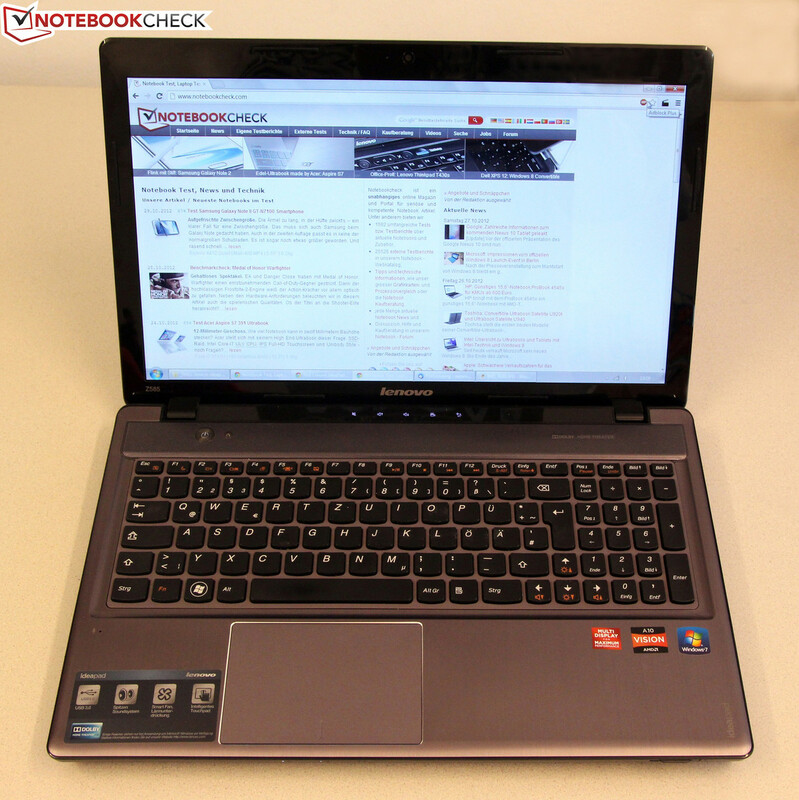 It is as it should be for a multimedia notebook, though it has somewhat shallow bass. In contrast, the mids and highs are clear and without distortions. The pre-installed Dolby Home Theater 4 has various sound enhancement options in the equalizer and also allows the creation of six additional sound profiles. Lower energy consumption is not insignificant for a mobile device, allowing its prolonged use without AC power. In idle, our test unit consumes between 9.3 and 13.1 W. These values are in the range of similar multimedia notebooks that have the difficult task of balancing high performance with low power consumption. In terms of the maximum consumption, the Z585 comes at the front of the middle class. It uses up to 75 W under full load, which can hardly occur in practice. 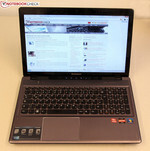 This is 5 W less than the similarly equipped Acer Aspire V3-551G-10468G50Makk. In the 3D benchmarks, our test unit consumed 53.4 W - a relatively good value. We determined the maximum run times with the tool Battery Eater. With minimum brightness, deactivated WLAN and Bluetooth, and energy-saving profile active, we measured the maximum battery life of 5 hours and 46 minutes. Our WLAN test offers more realistic results. With the display brightness set at about 150 cd/m² and activated energy-saving mode, our standard script reloads the web pages every 40 seconds. In this scenario, the battery ran out of steam after 3 hours and 41 minutes. In order to play a DVD without hiccups, we set the energy profile to "Balanced" and turned the wireless modules off. The notebook managed 2 hours and 42 minutes. The battery performance is on average at the middle of the list - the Intel counterpart, Lenovo's IdeaPad Z580 with Nvidia GeForce GT 630M, has better results. Unfortunately the manufacturer does not offer an upgrade to a larger battery. 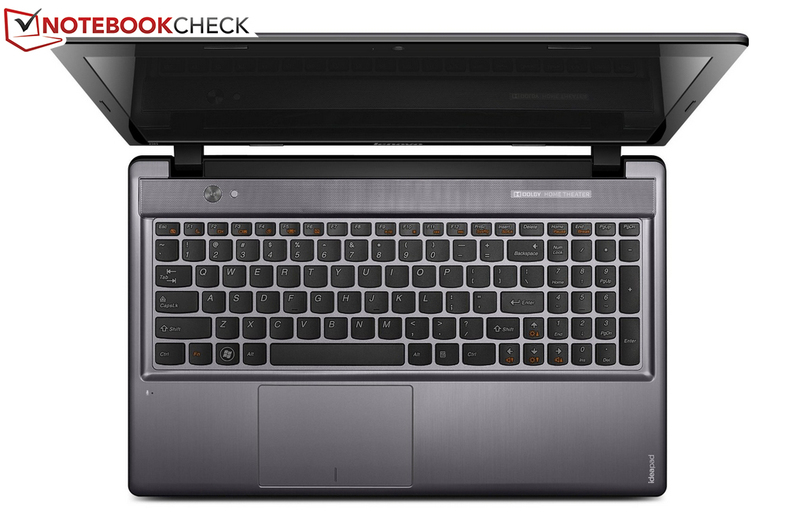 With the IdeaPad Z585, Lenovo offers a decent multimedia notebook at about 730 Euros (~$935). It is clear that you should not expect any wonders for this price. The stable plastic case, the features offered, and the accessories are usual for this price range. Lenovo tries to offer more flexibility to their clients with the separate number pad, but unfortunately that goes down the drain. It takes too much space out of the rest of the keyboard, limiting the size and usability of the two Shift buttons. 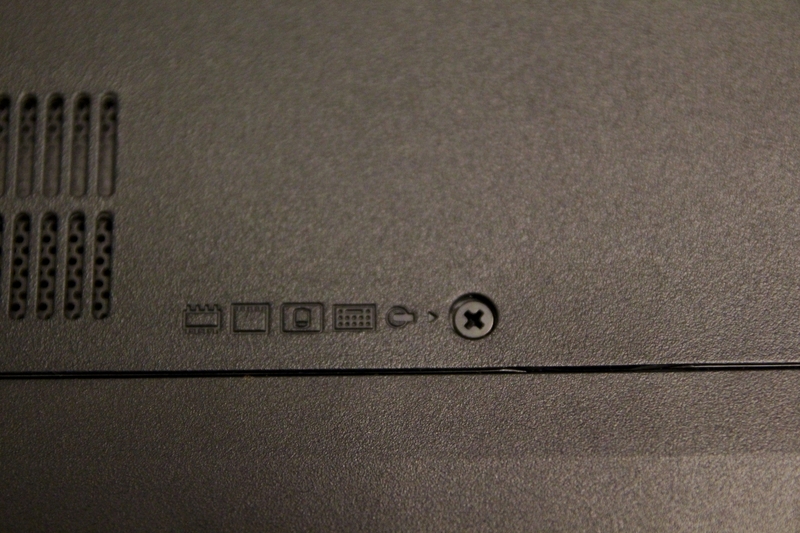 On the other hand, we liked the touchpad with its various settings. The glossy display is convincing for office work, but not for dark movie scenes and outdoor use. The crisp image via both the VGA and HDMI ports impressed us, while the somewhat short battery life is disappointing. As a compensation, the dual graphics solution manages to run modern games at medium settings, while still being cooled efficiently. Those needing less graphics and more CPU power should take a look at the similarly priced Lenovo IdeaPad Z580. In any case, the 15-inch notebook has managed to find its place. ...poses no problem thanks to the VGA and HDMI ports. ...allowing easy access to the hard drive and system memory. 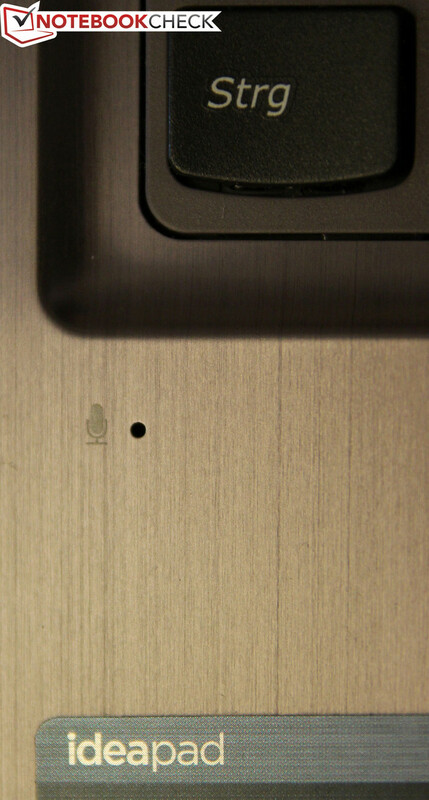 The microphone is located on the left side, below the keyboard. 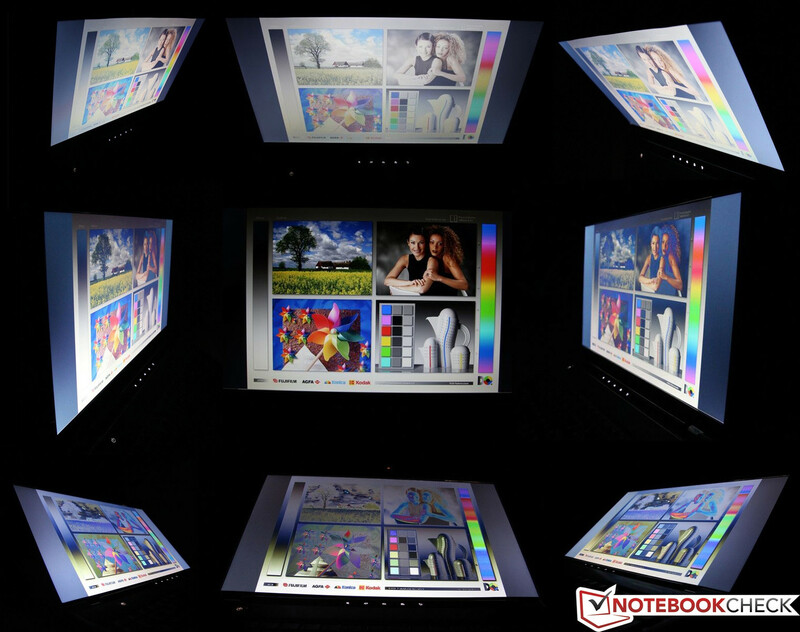 The Lenovo displays the highlights of the multimedia notebook. The good performance of the dual GPU and the stylish case. More space for the keyboard and a matte display for outdoor activities. The fundamentally good concept of a multimedia notebook for various needs. Unfortunately it lacks the "wow" effect. 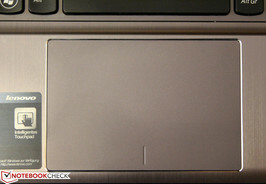 From the same manufacturer: Lenovo IdeaPad Z580.